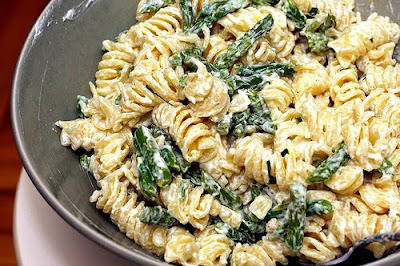 This pasta has lemon, lemon zest, asparagus and goat cheese. It sounds delicious. I am going to make it next week. I found it on pinterest but when I clicked further I saw it is a Smitten Kitchen recipe, which means it is probably as good as it looks/sounds. I used it as a partial inspiration when I made this Butter Noodles with Chives recipe from Epicurious. I made it mostly as directed except I boiled the noodles in chicken broth rather than adding it later and I added about a cup of feta cheese and a tablespoon or two of milk. It was delicious and easy. I recommend it.